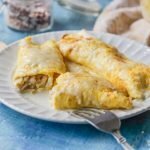 If you are in the mood for something creamy and cheesy, try this easy creamy chicken crepes. This low carb dinner is high in protein and has only 1.8g net carbs per serving. Spray both a small frying pan and medium frying pan and heat on the stove to a medium heat. Beat 1 egg and pour into smaller frying pan. Swirl to coat the bottom. When the bottom is cooked but not all of the top, loosen the edges with a spatula and flip into the larger frying pan. Let cook for a minute or two and then set aside to cool. Repeat process for all 8 eggs. Mix the chicken, half of the cheese, chiles, salt and pepper. Fill each crepe with the chicken mixture, roll up and place in a sprayed baking dish. I used a 9x9 pan. Pour cream over top of crepes and then sprinkle the other half of the cheese. Bake for 20 minutes and let cool a bit before eating.